A lovely riverside walk along the Thames Path from Richmond to Kingston via Twickenham. It's an easy waterside stroll running for just under 5 miles so should take around 2 hours at a leisurely pace. At the end of the walk you can catch a train directly back to Richmond from Kingston station. The walk starts on the 18th century stone arch Richmond Bridge. Pick up the Thames Path on the eastern side of the bridge and follow it south, passing the Terraced Gardens and Richmond Hill. The hill is a famous spot with a magnificent view back down to the Thames. It is the only view in England to be protected by an Act of Parliament and has been immortalised in paintings by Sir Joshua Reynolds and J. M. W. Turner. You continue past Petersham Meadow and Glover's Island towards Twickenham. Here you pass Eel Pie Island, home to Twickenham Rowing Club, about 50 homes and two nature reserves. The path then passes Ham Lands, a local nature reserve consisting of a variety of habitats which attract many bird and butterfly species. There's a wide area of grassland with scrub, flood meadow and various wildflowers to see in the warmer months. Shortly after you come to the lovely Teddington Lock. It's a very pretty spot with two 19th century footbridges and the rushing waters of Teddington Weir. The final section takes you past Canbury Gardens in Kingston. It's a nice riverside park with open lawns, tree lined footpaths, tennis courts and a band stand. Shortly after the route finishes at Kingston Bridge. The bridge is Grade II listed and was opened in 1828. To extend the walk you can cross the bridge and visit Bushy Park. It's a beautiful park with lots of deer, tranquil ponds, the attractive Cheshunt Avenue and the picturesque Diana Fountain. Hampton Court Park is also very close by. Here you'll find more deer and long tree lined avenues running along the Long Water canal. You can reach the park and the 16th century palace on our Kingston to Hampton Court River Walk. 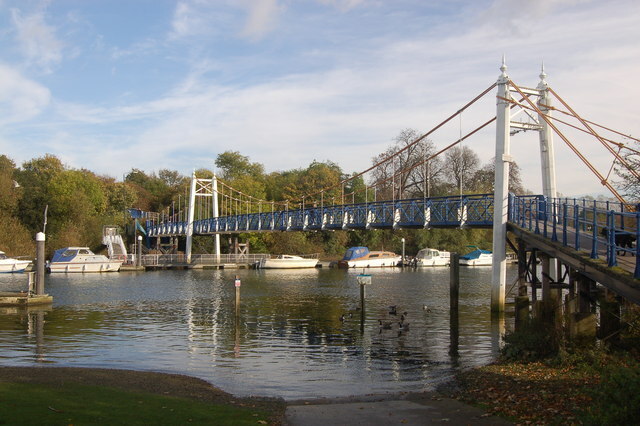 To further continue your waterside walking try the Putney to Richmond River Walk which takes you past Kew Gardens, Syon Park and Barnes Common.